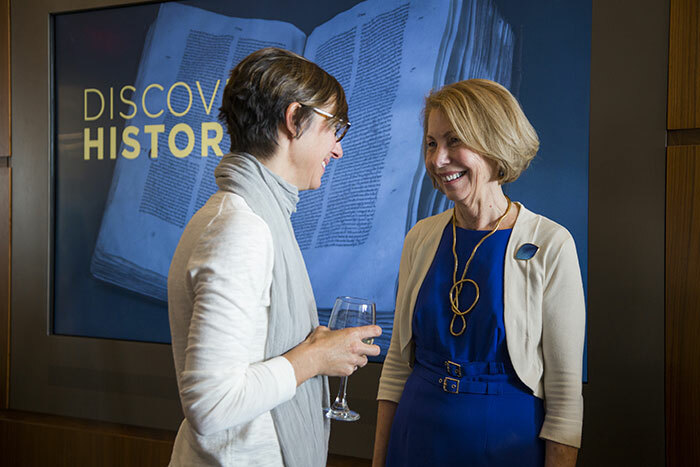 Allison Dykes, vice president and secretary of the university, greets Rosemary Magee at an event celebrating her service to Emory held earlier this month in Emory’s Stuart A. Rose Manuscript, Archives and Rare Book Library. Emory Board of Trustee Emerita Laura Hardman 67C, who worked with Magee in developing the Schwartz Center, welcomes those gathered to honor Magee. 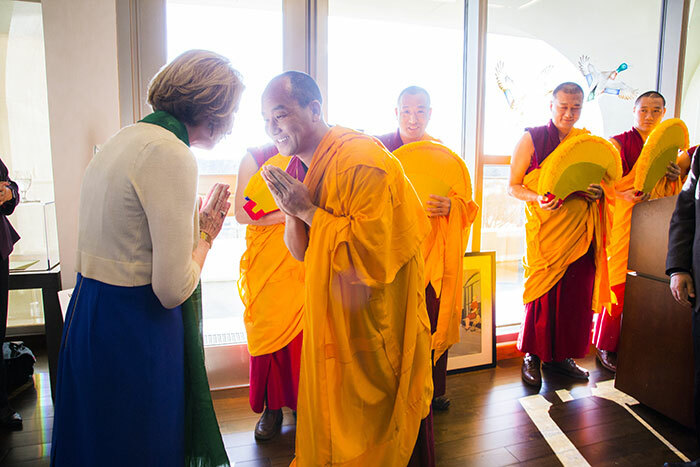 After a chorus of Tibetan monks chant blessings for her good health and long life, Magee shows her respect and appreciation. Emory benefactor Stuart A. Rose 76BBA, for whom the Rose Library is named, praised Magee’s talent for working with special collections. Gazing out the windows of the director’s office of Emory’s Stuart A. Rose Manuscript, Archives and Rare Book Library, Magee can pinpoint where Annex B once stood, within a cluster of temporary barracks constructed on campus shortly after World War II. Forty years later, those barracks had become temporary classrooms, part of a scattered network of spaces that housed Emory’s art, theater and music programs. For years, Emory had debated how to create a cohesive, centralized home for the arts befitting a top liberal arts university. By the mid-1990s, a campus committee had even offered a proposal, complete with blueprints. But amid conflicting visions, the project had stalled. Yet within the effort, Magee saw possibilities. A longtime arts enthusiast, she suggested to administrators that they revisit the process. “We have to bring our groups together and we need to rethink this,” said Magee, then a senior associate dean at Emory College. With quiet diplomacy, unwavering resolve and a talent for building bridges among campus constituencies, she did just that — gathering a “dream team” to help spearhead a new design and the fundraising needed to breathe life into a project some thought impossible. Not only were her instincts on target, they would help advance the construction of Emory’s Donna and Marvin Schwartz Center for Performing Arts, a multidisciplinary teaching, practice and performance facility that opened in 2003 to offer the arts a visible, inclusive home. Today, the Schwartz Center stands as a vital beacon to the arts. But Magee still keeps a photo of its humble predecessor — a reminder of the past, but also of what can emerge from the powerful alchemy of creative thinking, collaboration and hard work. That philosophy has guided Magee throughout many roles at Emory — a journey fueled by her own curiosity, as well as a delight in observing the growth of the university and its people, seeing all that is good in Emory becoming something even better. Earlier this month, Magee stepped away from the Rose Library and her administrative roles after 40 years spent in an astonishing range of positions and capacities. The coming months will bring a year of sabbatical before she retires. And with it, an opportunity to reflect on her service as a gentle diplomat and creative visionary who strove to help shape the institution that, she insists, actually shaped her. By now, Magee knows Emory from nearly every possible angle — as a student, alumna and scholar; professor and researcher; senior associate dean responsible for resources and planning at Emory College; member of the president’s cabinet and vice president and secretary of the university; and library special collections director. She arrived at Emory in 1977 to pursue a PhD in literature and religion at the Graduate Institute of Liberal Arts, while her husband, Ron Grapevine, earned a master’s degree from Georgia Tech. She graduated in 1982, the year her daughter, Rebecca, was born. Beyond her studies, Magee served as president of Emory’s Graduate Student Council (GSC), where she quickly caught the attention of campus administrators. When the university announced plans to close a graduate student dorm, the GSC gathered signatures to oppose it. “I was a protester and presented our petition to the person who oversaw residence halls at the time,” she recalls. That was Joe Moon, now dean of campus life at Emory’s Oxford College. Her level-headed activism made an impression. She was soon invited to serve on a search committee by the dean of the graduate school, giving her a deep glimpse into the inner workings of a university. And Magee liked what she saw. Following graduation, Magee taught in the English Department before joining Emory College of Arts and Sciences as assistant dean and director of summer programs, working closely with students; many still count her as a friend and mentor. Later, she was appointed associate dean for resources and planning and then senior associate dean, charged with administering a $100 million operating budget and capital projects of more than $150 million. For the Schwartz Center and related campus renovations, Magee would help spearhead a $40 million capital campaign. As executive director of The Arts Project, she also chaired a committee tasked with enhancing the arts at Emory. “At the time, I don’t think people realized how strong our arts programs were at Emory, because they weren’t always visible,” reflects Trustee Emerita Laura Hardman 67C, who worked with Magee on the Schwartz Center. Over the years, Magee learned to embrace opportunities as they arose. It is a way of life that she credits her son, Sean, along with her husband and daughter, for inspiring. For Magee, helping revive plans for a campus arts center was to become wholly intentional. There were obstacles and setbacks, but working with a cadre of faculty, staff and volunteers, Magee forged ahead. By 1999, she and Randy Fullerton, from Emory’s Theater Department, were among a delegation of Emory diplomats headed to New York to evaluate alumni interest in the idea. Gathering in the home of Emory alumnus William Cohen, Steve Sanderson, dean of Emory College at the time, was preparing to speak, but unexpectedly turned to Magee and Fullerton and said, “I think you should present this. Somehow, everything she’d learned about academic programs, teaching, budgeting and building seemed to crystallize. “It was a life-changing moment for me,” Magee reflects. 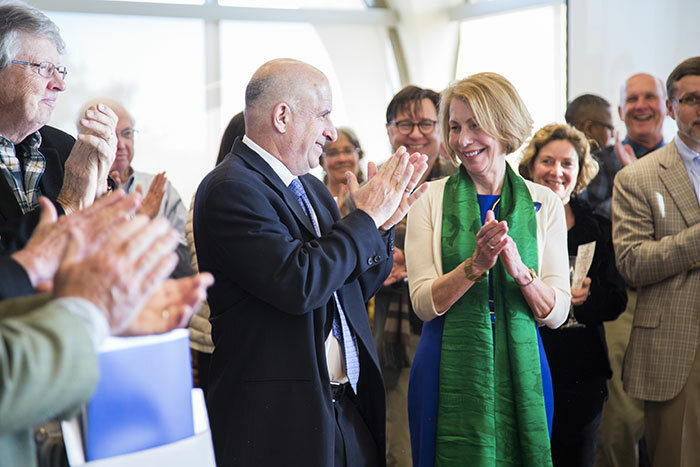 The next day, Marvin and Donna Schwartz 62C, an Emory alumna, pledged $8 million dollars towards construction of a new arts center. In 2005, Magee was asked to consider a new post — vice president and secretary of the university, working with the both the Emory Board of Trustees and the president’s cabinet. Initially, she declined. Then came a phone call. Chair of the Emory Board of Trustees, Ben F. Johnson III 65C was an accomplished lawyer who’d been a champion debater at Emory. “He figures you out, then he figures out what’s important to you and helps you see why an opportunity would be well suited,” Magee explains. Johnson urged Magee to consider how she could make the position her own. “I told her two people really needed her, a board chair and a very new president, and that the university wasn’t going to reach its potential without someone coordinating the activities of the board and administration,” Johnson recalls. Ultimately, Magee was swayed by her daughter, who on a visit home from college challenged her to see the possibilities: “You have no idea where it will take you,” she urged. It was an adjustment. Initially, Magee was the only woman at the table during gatherings of the president’s cabinet. As university secretary, Magee championed the role of faculty governance and helped in developing a more diverse and national board of trustees, says Johnson. To support her intellectual curiosity and passion for the arts, Magee was also charged with serving as a liaison to distinguished university professors, including author Salman Rushdie and Maestro Robert Spano. From those relationships grew Emory’s Creativity Conversations — one-on-one public talks Magee has hosted for over a decade with a range of scholars, writers, poets, artists and other intellectuals. Last month, in her honor, the university announced the creation of an endowment to support and sustain the program, which has been renamed The Rosemary Magee Creativity Conversation Series, says Leslie Taylor, director of the Center for Creativity and the Arts. Over the years, there were other opportunities, but Magee chose to conclude her career at the university she cares for so deeply. In 2012, Magee became director of Emory’s Manuscript, Archives and Rare Book Library. In that role, she would lead the library’s extensive renovation and renaming in recognition of benefactor Stuart A. Rose 76BBA. She also shepherded a series of high-profile acquisitions, from letters written by novelist Harper Lee and a college-aged Barack Obama to materials from civil rights journalist Eugene Patterson to activist Mari Evans, from beat-generation writer Jack Kerouac to the coveted archive of Flannery O’Connor. Many of these acquisitions were made possible by Magee’s gift for building enduring relationships, says University Librarian Yolanda Cooper, who praises her fierce advocacy and the access to hands-on learning promoted by Magee and her team. “The renovation of that space has more than tripled our capacity for teaching,” Cooper notes. Emory University Distinguished Professor Kevin Young, former curator of literary collections and the Rose Library’s Raymond Danowski Poetry Library, credits Magee with ushering in a new era for Emory’s special collections, highlighting its international qualities and making the archive a welcoming center for inquiry. “She helped pilot the library in a time of transition even as it was establishing itself — that is no small feat, to make a library that can be so widely recognized,” says Young, who now serves as director of the Schomburg Center for Research in Black Culture in Harlem. 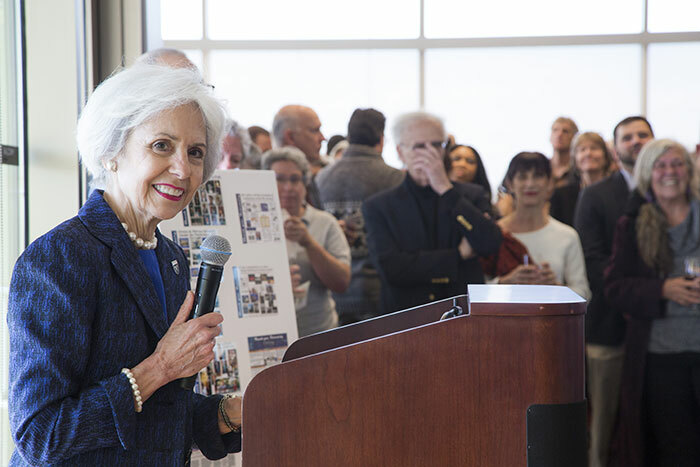 So it was fitting that friends and colleagues, poets and writers, faculty and former university presidents gathered in the Rose Library earlier this month to bid her a fond farewell. One by one, speakers described her impact, her professional finesse, her value as a trusted advisor, her ethos of caring. Former Emory College Dean Bobby Paul, with whom Magee worked closely over the years, warmly recalled the many buildings on campus today that reflect her touch. “These things that started out only as ideas, or even pipe dreams, often in her mind alone, have become realities,” he said. For now, Magee will write and travel before beginning a fellowship at the Fox Center for Humanistic Inquiry, where she plans to shape a collection of short stories and pursue other writing projects over the coming academic year. For Magee, it has been a fulfilling journey. And as a chorus of Tibetan monks chanted blessings for her long life and good health in haunting, full-throated song, she quietly listened, awaiting her next chapter.